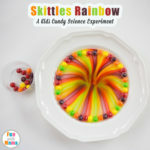 Have you tried the Skittles rainbow science experiment where you turn skittles into a rainbow? 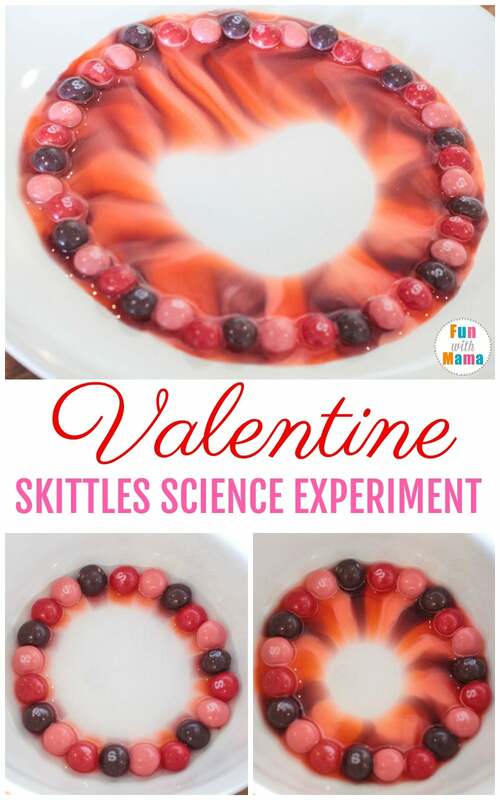 My kids love this activity so much that we just HAD to make a Valentine’s version. We used the purple bag of Skittles (removing the blue and green ones) to make our Science Valentines Skittles experiment. It’s so much fun when you can mix art and science together so easily using household supplies. 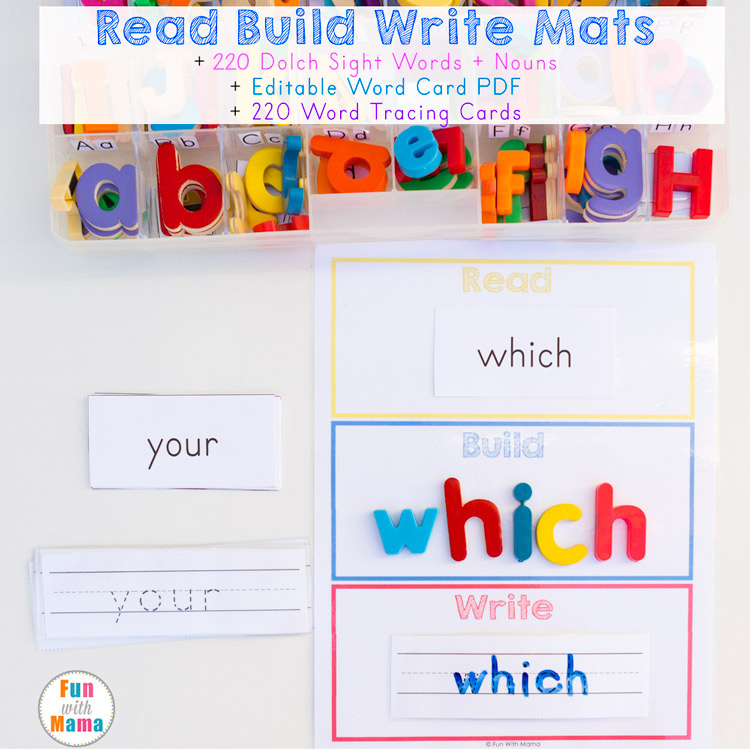 It’s a “wow” activity that kids will beg to do over and over! 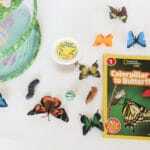 This is such an easy science experiment that kids will love. 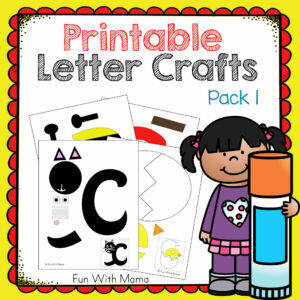 This activity is suitable for all ages, especially for toddlers, preschoolers, kindergarteners and even grade schoolers. My kids absolutely love science experiments! Although some science experiments require a lot of time and involvement, this one can be done in about 10 minutes. 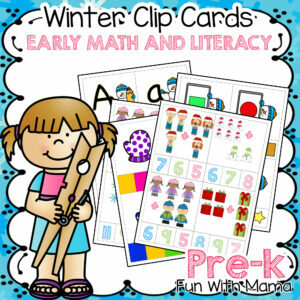 This activity was so much fun and the kids loved the Valentine’s Day twist to this activity. The Skittles Science fair project never fails to amaze us all! 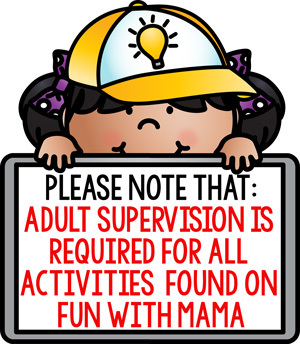 You will be glad to know that this activity only requires 3 things, and you may already have all of them! A plate or bowl… something that is slightly sloped in towards the middle and something that is sloped away from the middle. 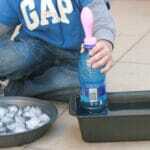 Water – Hot water will make the reaction happen faster, but experiment to see if cold makes prettier colors! We removed the blue and green Skittles from our bag for this Valentine version, but you certainly don’t have to remove them! The kids made a pattern of purple, red, pink. 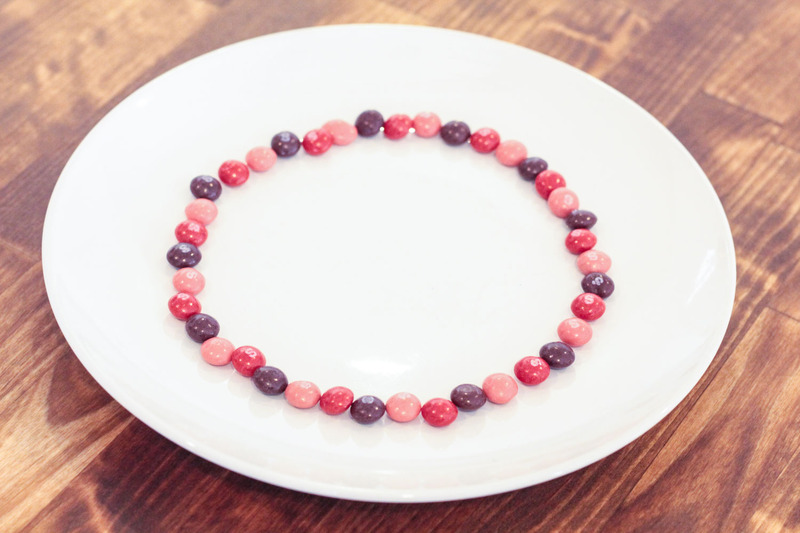 Line the edges of your plate or bowl with skittles. This will help the colors spread evenly. 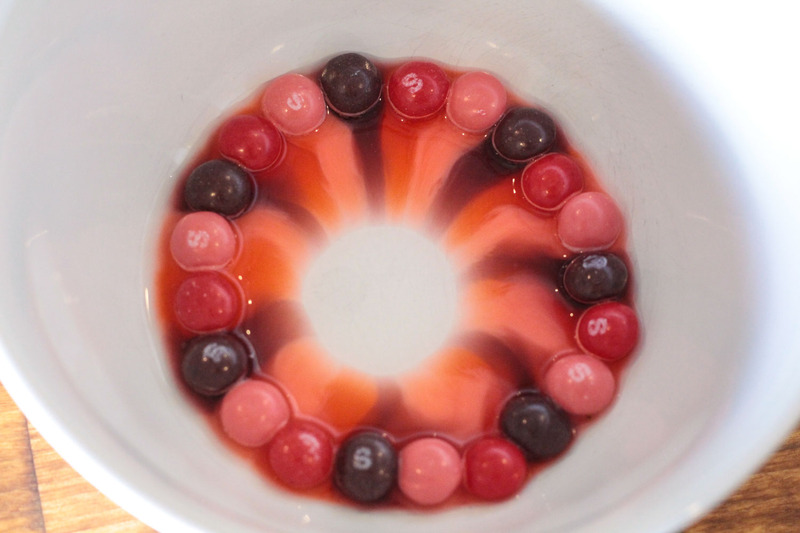 Pour water carefully over the skittles using just enough to cover the bottom of your container. Watch as the color spreads right before your eyes! It is truly amazing what skittles and water can do! 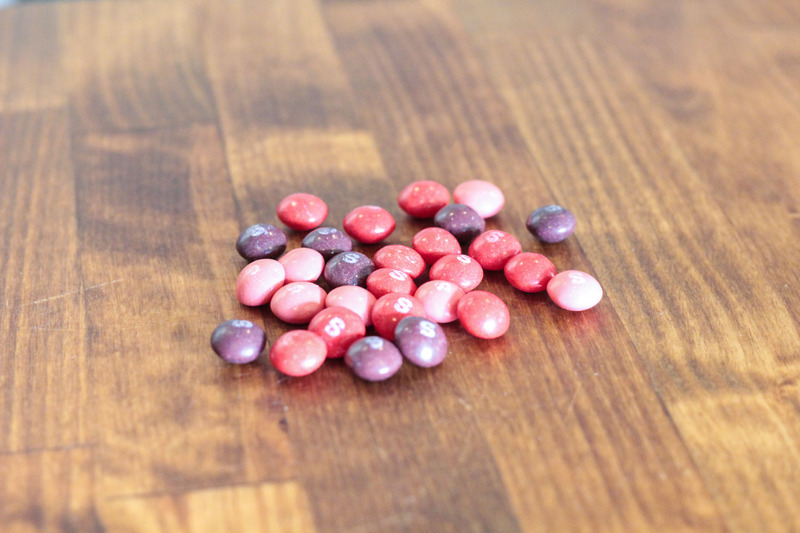 Experiment with arranging the Skittles in different shapes and watch what happens! 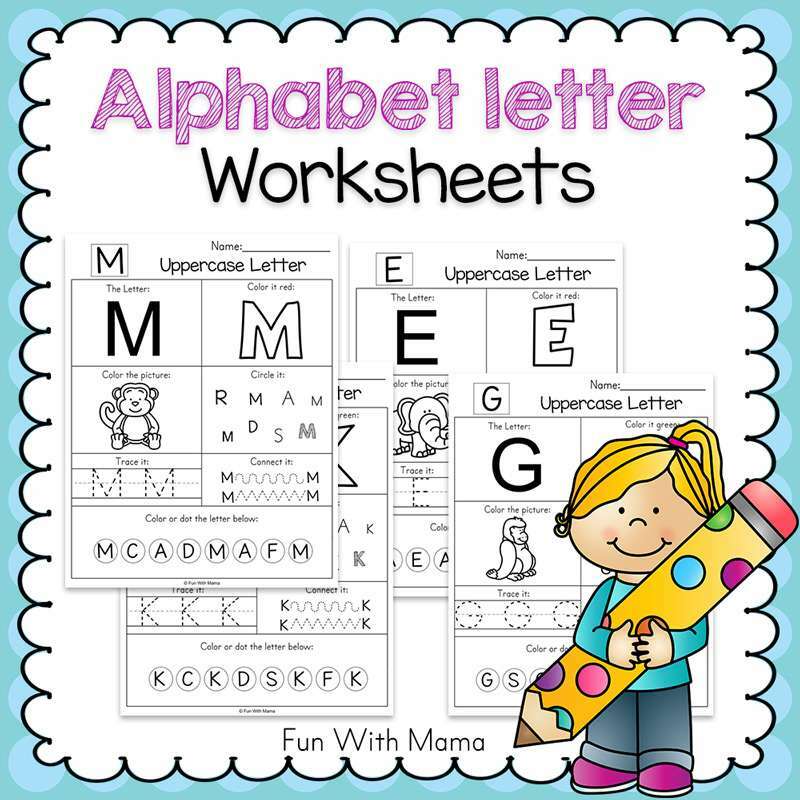 Variations: Older kids can work on patterning. We also experimented with using different types of containers to see if we could get the skittles to make different shapes. The kids loved that our plate made a heart! 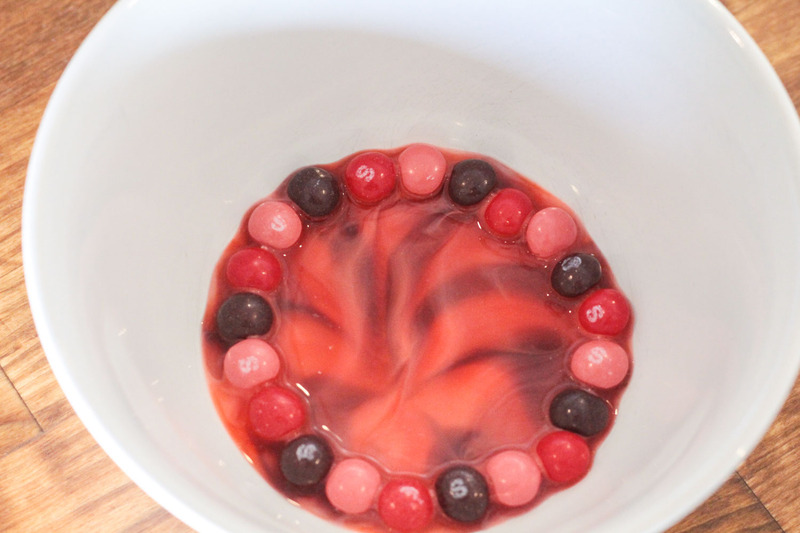 You can also experiment to see if using different temperatures of water will change the swirl of the skittles at all. 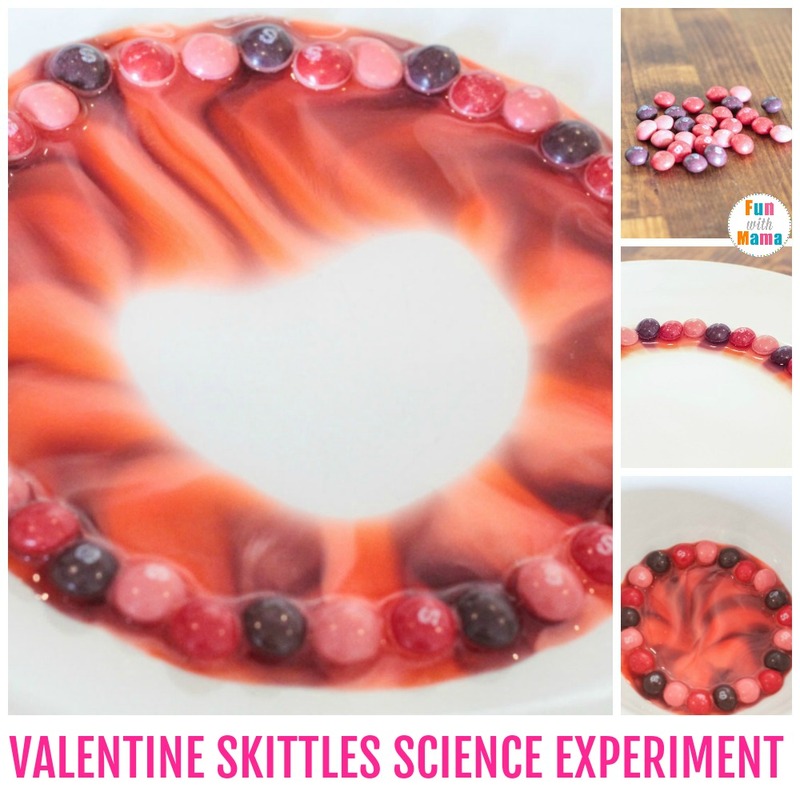 WHAT IS THE SCIENCE BEHIND THE VALENTINE SKITTLES FIREWORKS EXPERIMENT? 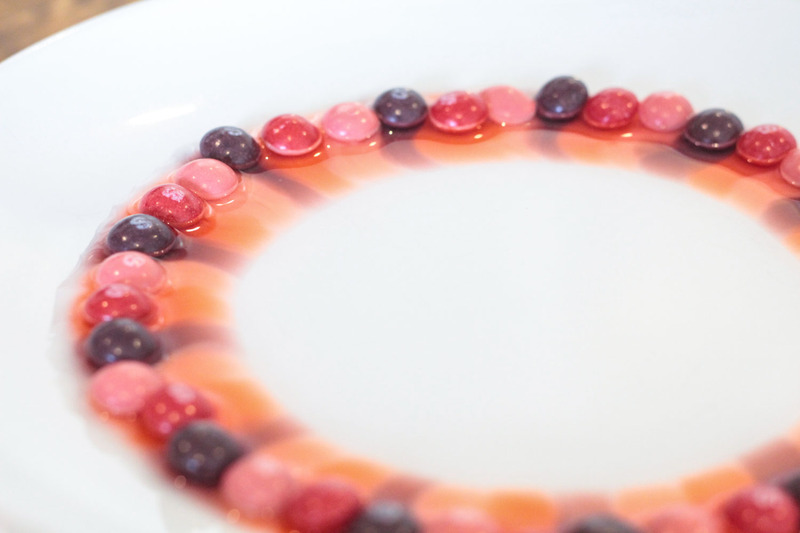 Skittles are made and coated with sugar, so once you add warm water to it the coloring and coat begin to dissolve very quickly. The slope of the bowl or plate determines where the sugar will spread. Did your kids love the experiment? 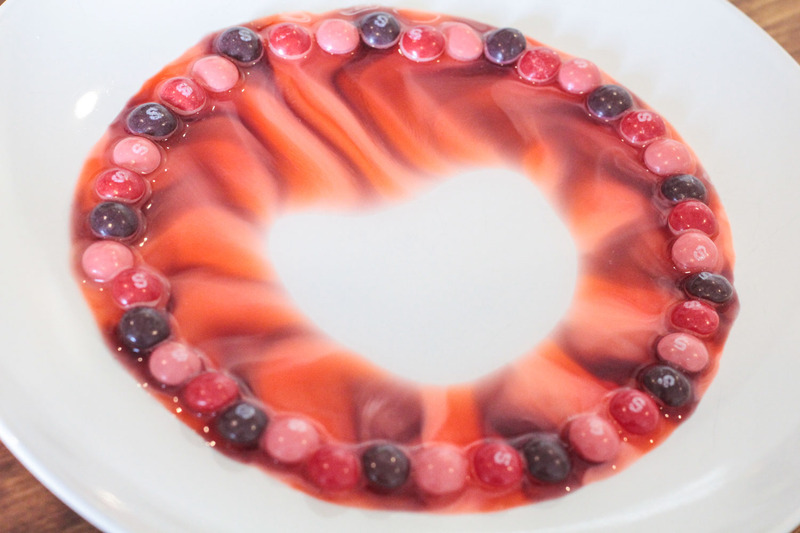 Then check out this fun Volcano science experiment or fizzy candy canes experiment too! 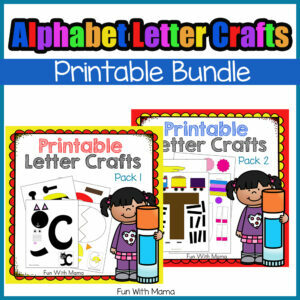 CHECK OUT MORE OF THE LATEST ACTIVITIES ON THE FUN WITH MAMA BLOG. 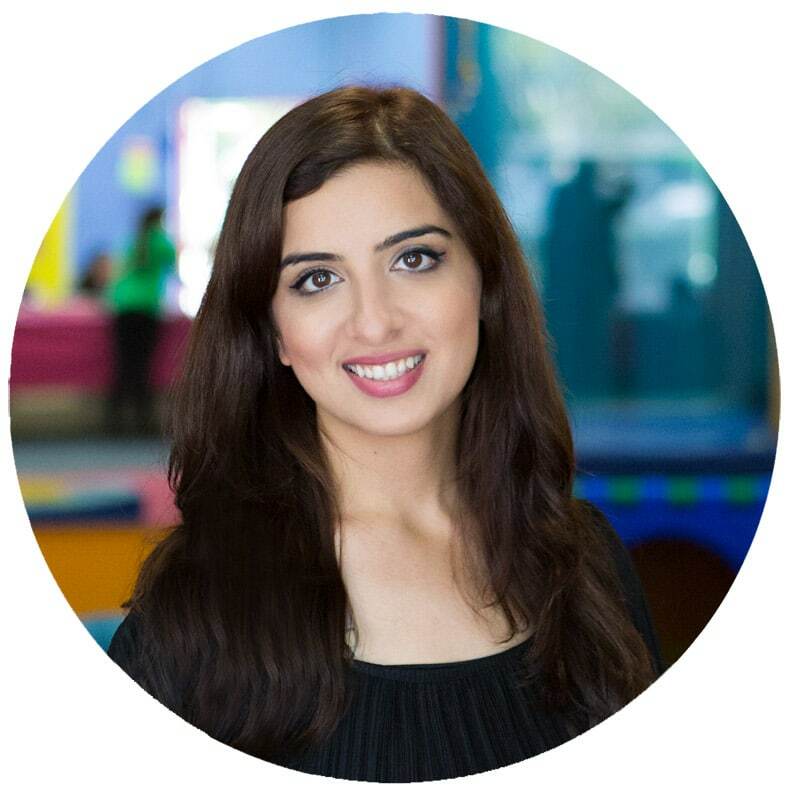 Make a Balloon Avalanche for your child’s birthday! 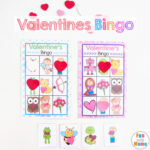 You can find all of our Valentine’s activities and crafts here.